Wednesday, March 17, 2010 at 7:30 p.m. Writers' engagement with popular cinema has long been limited in the popular imagination to the industry of screenplay writing leading to film production. Recently an inversion of this mode of production has captured the imaginations of poets and audiences. Using a form of live film narration inherited from practices in Japan and Korea during the silent film era, scenes from popular films are shown muted and re-narrated live with new language. These hybrid performances are satirical, critical, poetic, and analytic ways of "talking back" to the talkies. Konrad Steiner (SF) and Jen Hofer (LA) will present some background and conceptual framing about this new take on the movies and perform their own work along with writer/performers from Buffalo who will premier their own live cinema narrations. Filmmaker and curator Konrad Steiner lives in San Francisco. 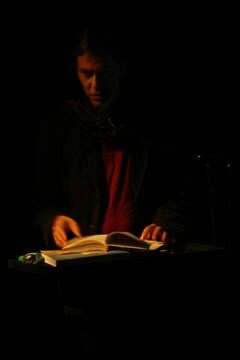 His engagement with the writing community includes video collaborations with Leslie Scalapino (text from way) and Mac McGinnes (with text by James Schuyler), producing live film narration events in SF, Los Angeles, New York and Portland, OR, and his own performances in SF's Poets' Theater. Jen Hofer is a Los Angeles-based poet, translator, interpreter, teacher, knitter, book-maker, public letter-writer, and urban cyclist. Her most recent books are a series of anti-war-manifesto poems titled one (Palm Press, 2009); sexoPUROsexoVELOZ and Septiembre, a translation from Dolores Dorantes by Dolores Dorantes (Counterpath Press and Kenning Editions, 2008); The Route, a collaboration with Patrick Durgin (Atelos, 2008); and lip wolf, a translation of lobo de labio by Laura Solórzano (Action Books, 2007). She teaches at CalArts, Goddard College, and Otis College, and works nationally and locally as a social justice interpreter. Poets Theater/Cinema Cabaret co-curated by Jen Hofer, Konrad Steiner, and David Hadbawnik. Poets Theater thanks the following for their support: The David Gray Chair of Poetry and Letters, SUNY at Buffalo; the English Dept. at UB; the English Graduate Student Association at UB; the Graduate Poetics Group at UB.